This splendid box was painted by talented artist Alexey Valyalin of Fedoskino. Since boyhood, Alexey has been fascinated with the sea. At one point his father took him to the Museum of Art in Feodosia (Crimea) during their vacation to the Black Sea. This art museum was converted from the studio of Ivan Aivazovsky, Russia's greatest seascape artist who was born, raised and eventually finished his career in Feodosia. Since then Alexey is an admirer of Aivazovsky's works. There can be no doubt that this visit to the museum, in addition to his own artistic talent, influenced his decision to become an artist and paint seascapes. Before he realized that dream and attended the Fedoskino Art School, he served for three years in the Soviet Navy on an anti-submarine ship that was stationed in Latvia. 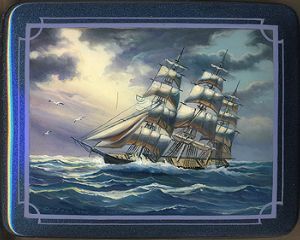 On the box's lid Valyalin painted a ship with the full sails. The waves are high and strong, but the speed is pretty high. The box's exterior is covered with a mixture of a silver and blue colors paint. The composition is framed with blue lines and two parallel lines are decorated the box's sides. The box's interior is traditionally covered with red lacquer. The box is made out of paper-mache. The box's lid is hinged from the top of the scene. The work is signed with the artist's name and Fedoskino.